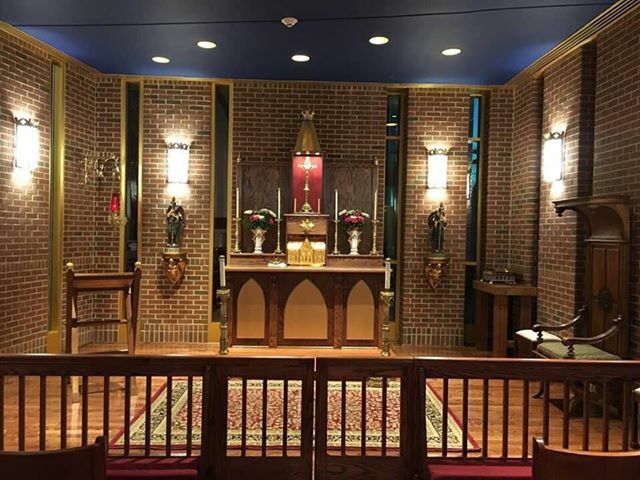 Father Christopher Smith of Prince of Peace Catholic Church in Greenville, South Carolina very kindly shared with LAJ a few photos of their redesigned Adoration chapel. Those of you who are already familiar with that church will know that it is a reasonably modern church structure with some traditional elements. Above is their previous chapel design which had a smaller altar vested in a Laudian style frontal -- or something akin to one. Behind and around where a hodge podge of devotional elements, including a banner, statue of the Virgin and so on. The first thing you'll note is the altar which, while being quite humble in its design, has better proportions for this space. Not entirely visible in this photo is the inclusion of the predella as well. Attached to the altar is a simple reredos that can house an altar cross or monstrance depending upon whether Adoration is taking place. This has a red backdrop which helps to emphasize the cross/monstrance. Overall the space is characterized by a better sense of order and symmetry. The reason I chose to include this photo is because I would particularly like to draw your attention to the altar frontal. One can see here just how much the addition of an altar frontal can change the whole character of the altar and its surrounding space. 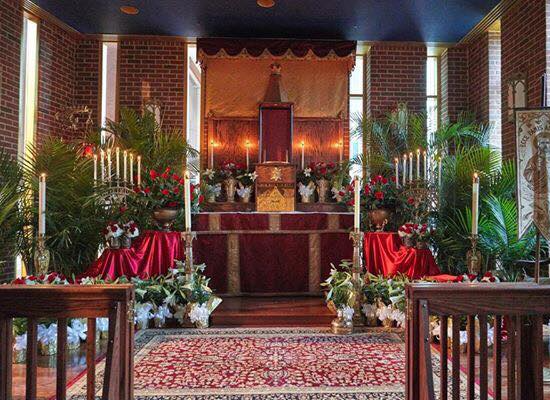 I would certainly recommend to the parish that this new altar always be vested with an antependium as I believe that will bring the most noble result.